What The Hell Is MoJo? Your MoJo is how you communicate who you are. We all have MoJo; however, YOUR MoJo is determined by your unique personality. For some of you, your MoJo is a clean, sophisticated, corporate feel. For others, your MoJo is a loud and aggressive swagger. MoJo Art & Image helps you present your image to the world thru the medium of apparel, head wear, and promotional products. MoJo Art & Image is a Baltimore based company founded in January 2013. We are proud of the investment we have made in state of the art production facilities and equipment. 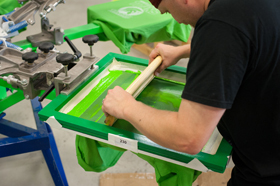 Our staff is extremely experienced with decades of expertise in automatic & manual screen printing, color separating, screen preparation, embroidery, and design. Customer service is the cornerstone of our corporate philosophy. We understand that helping you look good, whether that is through great product or timely deliveries, is the key to our business success.